Our duty glove is constructed with a premium leather shell and with wit zipper closure, which offers a significant amount of dextarity and comfort and for easy on and off. You feel comfort during driving, Dress, shooting and search a suspect. 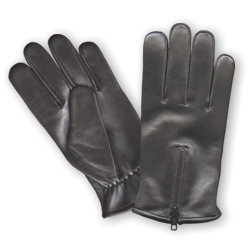 These glove available in sheepskin and cowhide and with cut resistant Kevlar® lining. o Zip for easy on and off. o Also available in Kavlar lining or Fleece lining or without lining.